Do your neighbors’ cats keep coming into your garden? Here's the animal-friendly solution to keep them out! Do your neighbors’ cats keep coming into your garden? Here’s the animal-friendly solution to keep them out! Your neighbours’ cats will stop coming into your garden if you use this animal-friendly trick! We definitely love animals, but other people’s cats doing their business in our gardens? No, thank you. Luckily, there’s an easy, animal-friendly solution that will stop cats from coming into your garden and pooping everywhere! 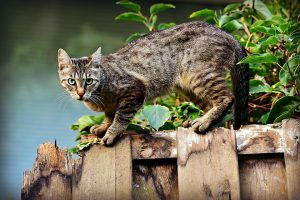 You can discourage cats from coming into your garden in several ways that aren’t harmful to the sweet little animals but do give you the desired result. For example, cats dislike certain smells, which means those scents are perfect to use in your plot to keep them out of your garden. It’s perfectly possible to be a cat lover and keep cats from pooping in your garden. Just use these tricks! All the things you need are completely natural and easy and cheap to get by in your local supermarket. Cats are lovely and adorable animals, of course, but they’re a bit less cute when they pee, poo and dig all over your yard. This can cause you and your garden quite some grievances, so you might just be looking for some tips to avoid this! Because we love animals, we’re no fans of the idea of scaring off cats with chemicals or awful approaches that aren’t animal-friendly at all. We believe keeping cats out of your garden can definitely be done in a natural way that isn’t harmful to anyone.